Sony has announced a new cloud-based TV service, which will offer a large selection of TV channels without a monthly contract and be available across a range of devices. It's Sony's play to replace your cable box. Originally spoken about at CES 2014 back in January, PlayStation Vue will roll out as an invite-only beta for PS4 and PS3 in November, and then hit on other "Sony and non-Sony devices" at some undisclosed point in the future. 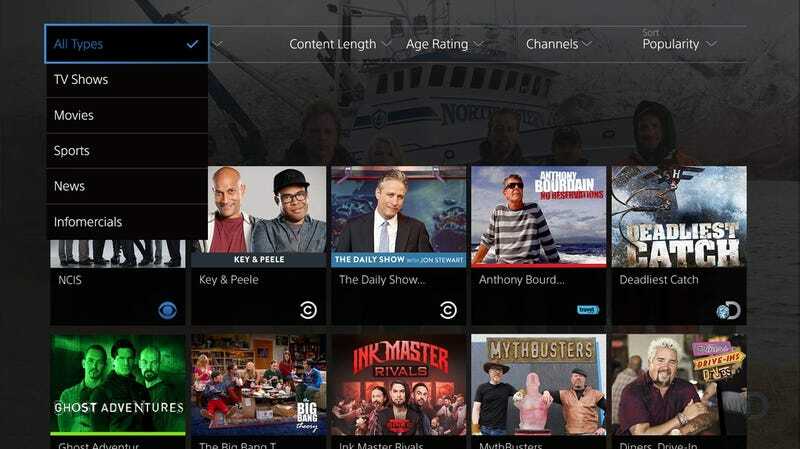 The beta will first be available in New York, offering around 75 channels—including those owned by CBS, Fox, and NBCUniversal. Currently pricing remains unconfirmed. But what Sony does say is that it won't require any monthly contracts or extra hardware to use, and there won't be any installation charges. The entire service will our to everyone in early 2015. Speaking to Bloomberg BusinessWeek, Andrew House, president of Sony Computer Entertainment, said that "this is an opportunity, in my view, to fulfil a longer goal of transforming what was in the past a dedicated game device into a proper entertainment hub. There is nothing in entertainment as broad as the mass-market live-TV space." Quite. Of course, how easy it will be for Sony to compete with old-style cable subscriptions remains to be seen. As Businessweek already notes, some of the channels that PlayStation Vue offers won't actually be available on mobile devices, because it couldn't snag agreements that made it so. Nor will shows be available for longer than 28 days.